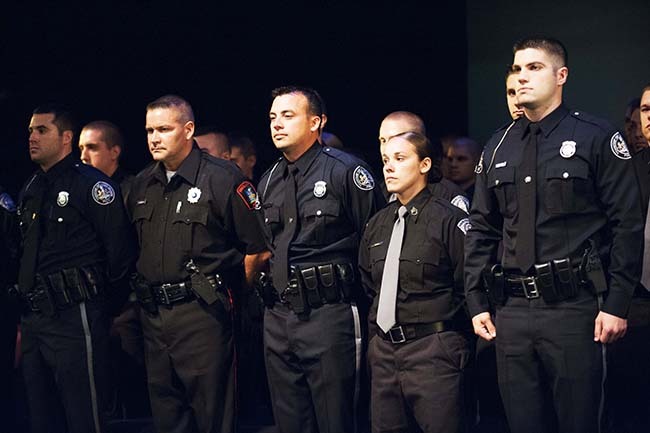 Fifty-one cadets graduated from Montgomery County Community College’s Municipal Police Academy on July 17 during a ceremony held at the College’s Science Center Theater, 340 DeKalb Pike, Blue Bell. In what has become an academy tradition, Chester County Deputy Sheriff and academy alumnus Wayne T. Johnson sang the National Anthem to begin the ceremony. 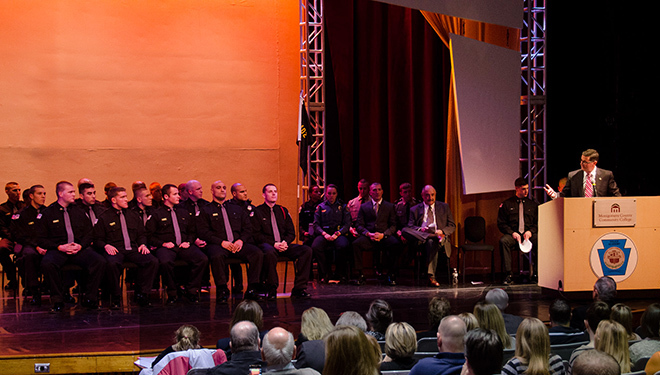 Steven A. Beck, coordinator of school safety with the Montgomery County Department of Public Safety, and Paul N. Leo, district justice, both instructors at the academy, were selected by classes 1203 and 1301 to give keynote addresses. Montgomery County Commissioner Bruce L. Castor Jr., County Deputy Chief Detective Samuel Gallen and County Sheriff Eileen Behr also attended the ceremony, along with representatives from East Norriton, Upper Merion, Lower Merion, Upper Moreland and Plymouth Township police departments. Earning the highest GPA in their respective classes, Cadet Sgt. Michelle Geiger, Allentown, and Cadet Cpl. Christopher Moser, Norristown, offered remarks on behalf of their fellow graduates. “You’ve taught me that being successful is about meeting your goals, no matter how big they are,” she said. In his remarks, Moser praised the quality of the academy’s instructors, noting that most are senior law enforcement professionals. 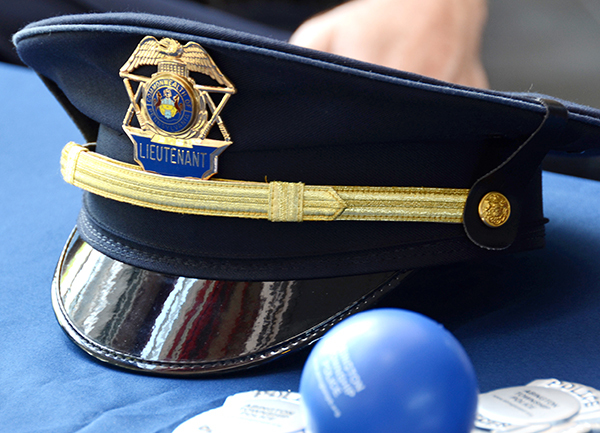 “The most important thing we learned is to have the confidence to do this job,” he shared. 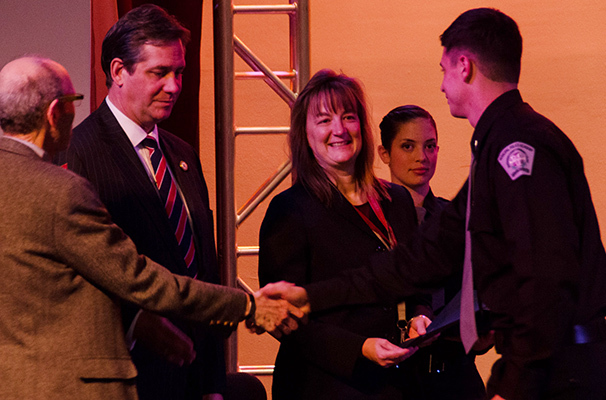 Academy Director Frank Williar presented an Award of Merit to Cadet Capt. 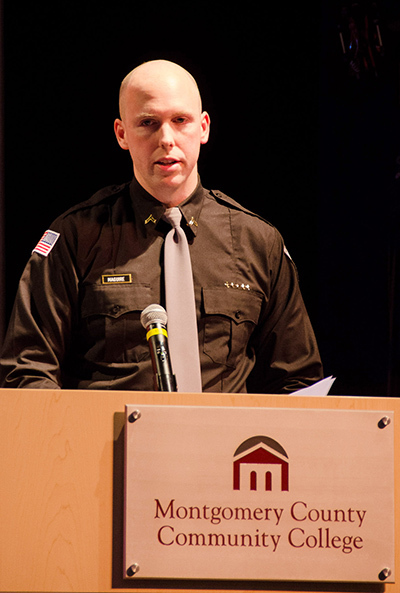 Craig Bald, Conshohocken, who served as the commanding officer over all three classes during his academy tenure. “Very seldom do I give the responsibility of commanding the entire academy to a cadet, but in this case, I did, and the return was tenfold,” shared Williar. Other honors presented during the ceremony included the Leadership Award to Cadet Lt. Holly Donohue, Philadelphia, and Cadet Lt. Joseph Gary, Montgomeryville, and the Spirit of Distinction Award to Andrew Ammaturo, Willow Grove, and Cadet Cpl. Jerry Ploskon, East Norriton. Robert McCole, Lafayette Hill, and Cadet Sgt. Michael Mitchell, Pottstown, earned the Sgt. James R. Miller Marksmanship Award in their respective classes. The award is presented in memory of Upper Dublin Police Sergeant Jim Miller, who died in an automobile accident while on duty in 2004. Cadets from class 1203 attended the academy part time, Monday through Thursday evenings for 42 weeks. Graduates include Andrew Ammaturo, Willow Grove; Steve Bailey, Collegeville; Holly Donohue, Philadelphia; Michelle Geiger, Allentown; Michael Iller, Bensalem; Timothy Kern, Hatboro; Jen Kobe, North Wales; Stephanie Kolb, Souderton; Robert McCole, Lafayette Hill; Patrick McLaughlin, Bethlehem; Ed Miller, Horsham; Andrew Naimoli, Wayne; Tom O’Neill, Philadelphia; James Potoka, Newtown; Michael Sheehan, King of Prussia; Steve Valdez, Allentown; Christopher Yuhasz, Harleysville. Cadets from class 1301 attended the academy full time, Monday through Friday for 22 weeks. Graduates include Sakyi Amoh, Wyncote; Joseph Austin, Norristown; Craig Bald, Conshohocken; Richard Binder, Warminister; Andrew Bixler, Bucktown; Kyle Brierley, Yardley; Nicholas Carabello, Springfield; Margitta Delaney, Pottstown; Sean Franchini, Lower Providence; Michael Frugoli, Warwick; Shane Galette, Conshohocken; Joseph Gary, Montgomeryville; Brian Harrison, Souderton; Marc Lee-Newton, Wyncote; Brendan McCann, Royersford; Michael McFadden, Media; Michael Maguire, Glenside; Michael Mitchell, Pottstown; Christopher Moser, Norristown; Josephine Murray, Philadelphia; Charles Myrsiades, Plymouth Meeting; Nicole Navarra, Warrington; Christopher Noga, Elkins Park; Jerry Ploskon, East Norriton; Justin Polisi, Philadephia; Larissa Reggetto, Effort; Donald Reilly, Norristown; Royce Repka, Lansdale; Matthew Rice, Philadelphia; Megan Rigous, Warrington; Michael Rosa, Conshohocken; George Seifert, Harleysville; Matthew Shade, Souderton; Joseph Wood, Green Lane.